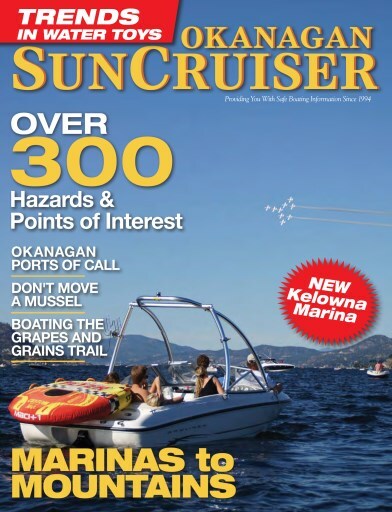 This one-of-a-kind publication will provide you with useful charts of the Skaha, Okangan, Wood and Kalamalka Lakes as well as helpful advice, hazards, points of interest, entertaining destinations, dive sites, boating safety tips and regulations. 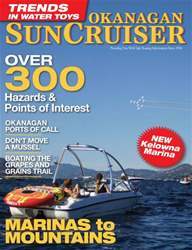 Read about the new Downtown Kelowna Marina and how it allows you to boat to the Grapes and Grains Trail. There danger on a lot of hulls, trailers and in ballast tanks - find out how you can prevent the spread of the European mussel invasion. There's some cool trends in water toys you'll want to know about before you lay out your cash for this years vacation or staycation and an expose of Canada's largest independent boat builder - Campion Marine who've been quietly buying up new brands. From the mountains to the marinas this is a terrific issue to keep in the boat avoiding the hazards and finding those secluded ports of call.